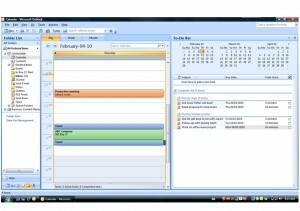 Working Sm@rt with Outlook training in Toronto and onsite training in your office easily arranged. We have been helping busy professionals be more productive for over 30 years. Far from being a refresher on Outlook the course unlocked the power of Outlook to become a real productivity enhancement tool that improves work-life balance. Arnold Drung (President) Conestoga Meat Packers Ltd. Working Sm@rt with Outlook a time and workload management course. Participants in Working Sm@rt with Outlook on average increase their productivity by 68 minutes per day. Common practice today for the majority of individuals is having hundreds or even thousands of emails in their Inbox. In examining what all this email is you will find there is email that needs to be followed up on, email that has information that is needed at some point and email that may have been read a few times that people are uncertain about. I feel back in control of the day! Why participate in a Working Sm@rt with Outlook program? “Endless emails, an overloaded Inbox, missed follow ups, missed deadlines, constant interruptions, crisis management, long and stressful days, a messy or cluttered desk.” These are not a minor irritation. They are a massive problem! So we have a choice ORGANIZE or AGONIZE. Learn how to use Outlook as a planning tool. The breakeven point investing in the program is about 3 minutes per day. The average increase in productivity is 68 minutes per day. We have done post workshop surveys with organizations and have found the return on investment to be between 600% and 1200%. Key Learning Point (KLP): That work is now mental not physical and new processes are needed. KLP: That having multiple places to put reminders to do things is stressful and counterproductive. KLP: Raised awareness of how much time we waste and numerous tips on how to be more productive and in control. KLP: That fixing problems does not add value. They are necessary non value added elements of the day. It’s better to do it right the first time. KLP: Value of ONE calendar. Blocking time for high value added work. KLP: You need to know where you’re going. KLP: How to plan, record file and retrieve conversations. KLP: How to clean up in the inbox (email), in-basket (physical papers) and the desk. Far better CONTROL of the work. Correct use of Tasks and the To Do Bar. Increase productivity and reduce stress and crisis management. Learn how to better manage information and save a massive amount of time everyday. Working Sm@rt with OneNote is available for substantial amounts of information. How to stop polluting your Calendar with things to do (which should only hold appointments—not ‘to-do’s!) and book appointments easier and more timely. How to work from one task list so you separate and stay on top of urgent, important–and non-urgent—tasks. A minimum of 8 attendees’ is required. To see our scheduled dates in various cities, please click here to view the product listing, then select the city you’re interested in. Working Sm@rt with OneNote training to learn how to better manage large amounts of information and work better as a team. Email Writing for Business training to communicate more effectively by email. For all other cities in North America, please contact us directly. Web Development by CrookedBush.com Inc .